SIDLE UP TO THE BAR at San Francisco’s modern Moroccan restaurant Mourad and find cocktails built of syrups flavoured with persimmon and saffron honey. Over in New York, Dante’s drink list calls for concord grape and salted rosemary syrups, while down south in New Orleans, Jeff ‘Beachbum’ Berry’s Latitude 29 tiki hall couldn’t shake together an Espresso Bongo without its coffee syrup made on-site. As food culture has evolved and matured throughout the world, so too has that of drinks. Whether it’s the tools to make those drinks, or the ingredients which flavour them, the world of craft bartending seems now to have touched almost every establishment with a liquor licence, at least in some small way. And, even further, today it’s easier than ever to play expert bartender at home. In fact, one of the prime reasons almost any bar is currently able to mix up a bevy of complicated cocktails, and why it’s easy for the neophyte imbiber to build complexly-flavoured creations at home, is due in large part to the rise of quality bottled syrups up for grabs. But let’s rewind for a second. What, exactly, is a cocktail? The most straightforward definition is a drink made with at least two ingredients, one of which is alcohol. And while many pre-Prohibition cocktail recipes call for such basic components (like an Old Fashioned: a mix of whiskey, sugar, and bitters), in 1862 the father of modern bartending Jerry Thomas published his seminal collection of cocktail recipes in How To Mix Drinks or The Bon-Vivant’s Companion – the first US cocktail book ever published. And it was around this time that alcoholic potations began to evolve. Grab a seat at Little Smith in Tokyo, one of the city’s most revered craft cocktail haunts. Just behind the bar one will note bottles of Monin syrups at the ready, used to flavour the dark den’s classic and more modern-styled drinks. Monin, in fact, was one of the first companies dedicated to improving the flavour of alcoholic beverages. Georges Monin, a French manufacturer based in Bourges, about a two-and-a-half-hour drive south of Paris, launched the brand in 1912 after entertaining a party of friends and realising, post meal, that the cordials he had on hand were tasteless. Today, Monin syrups are for sale in 140 countries, and the brand has extended its product line to include fruit purées and smoothie mixes. In the US, one of the earliest cocktail modifier companies began in 1925, originally as a line of syrups created by Rinaldo and Ezilda Torre, used to flavour Italian sodas. Torani syrups, born in San Francisco though rooted in Italian tradition, initially launched in flavours such as almond (orgeat), grenadine and lemon but, similar to Monin, the company has since expanded to more than 50 countries and includes flavoured sauces and concentrates. While orgeat and grenadine may have served as some of the earliest cocktail syrups used by bartenders over a century ago, they’re still just as popular today – especially for those who manage tiki bars where tropical drinks often call for a myriad exotic flavoured syrups. “For tiki bartenders, they’re essential,” states Berry. Frank Cisneros of Brooklyn, New York’s Japanese cocktail lounge and eatery Karasu agrees: “To me [cocktail syrups are] crucial. They are more important than any other modifier. Fresh citrus, well-made syrups made of the highest quality ingredients, and the best-made spirits are the cornerstones of cocktail making,” he says. Today though, with more access to ingredients and overall better educated and sophisticated bartenders and imbibers, cocktail syrups have evolved far beyond the early days. “I think as consumers’ palates have changed over the years, so have cocktails and the way that they’re built. Palates evolve, and so must the ingredients,” says Brian Means, corporate lead bartender for San Francisco-based chef Michael Mina’s restaurant collection, the Mina Group. However, some high-quality syrup companies, such as Allison Goldberg’s Fruitations and Jennifer Colliau’s Small Hand Foods – both available throughout the US – were created specifically for professional bartenders as opposed to those at home. Goldberg launched Fruitations in 2012 initially as a product to help quickly build flavoured sodas, but after adding a splash of vodka to a drink one day, she saw Fruitations’ potential. “I recognised the transferring trend: consumers were increasingly eating more speciality foods, and if they wanted the best ingredients for food, wouldn’t they want the same for their drinks?” queries Goldberg. Six months later she met Pam Wiznitzer of New York’s acclaimed Seamstress bar and that encounter helped her understand that “bartenders were clamouring for their own speciality ingredients to support their imagination”. Especially at high volume bars who wanted to serve quality drinks without hours of daily prep. Wiznitzer says: “A lot of bars make their own syrups, but the rise in syrup production has escalated over the past few years because of the demand of craft cocktails and the variety of syrups that are necessary to make certain drinks available. Some of the syrups are more mainstream, such as an orgeat or ginger, but other companies are offering great flavours and make them a million times better than your local bar.” Which is a win for everyone – the producer, the bartender, and the consumer. Small Hand Foods is one such brand. Colliau launched her syrup line in 2008, a bit earlier than some of the more popular lines such as Jack Rudy Cocktail Co. At the time, “commercially available [syrups] were made with flavourings, not from actual fruit or nuts, and often with high-fructose corn syrup and artificial preservatives,” she says. 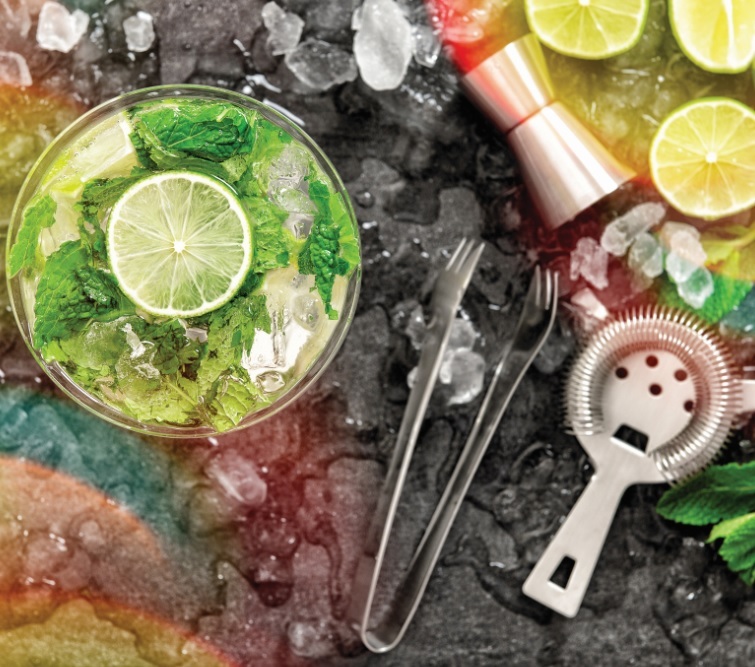 Once she began building Mai Tais and other cocktails with the syrup, other bartenders started asking if they could buy it for their bar, and Small Hand Foods took off. Now one can find Colliau’s products in top cocktail haunts such as Seattle’s Damn The Weather, PDT in New York, and even at Singapore’s 28 Hongkong Street. While about 80% of Small Hand Foods’ business comes from professional bars, Colliau’s products are available to non-professionals. “The home enthusiast market is growing, for sure,” notes Colliau. Companies such as Austin, Texas’s five-year-old Liber & Co and Atlanta, Georgia’s two-year-old 18.21 Bitters both target home bartenders. Whether you’re looking for orgeat, tonic syrup, or a way to quickly infuse kaffir lime into a drink, so many syrups and cocktail mixers are now for sale that entire stores are opening dedicated to the stuff. Oxbow Public Market in California’s Napa Valley counts Napa Valley Distillers – a store that sells tools for the home bartender, from bitters to syrups to bottled cocktails – while Brooklyn, New York’s The Meadow sells similar bar-friendly ware, in addition to salt and chocolate. Ultimately, a cocktail calls for just two ingredients, one of which must be booze. But in today’s climate of craft concoctions, two is almost never enough. While bottled syrups can help busy bars execute tricky tipples in less time, such products also serve as the tools to help home imbibers elevate their own show to a professional level.